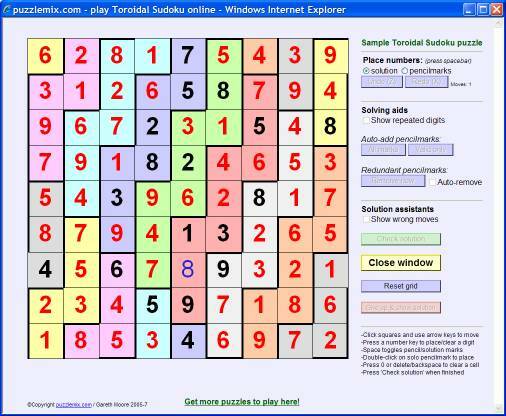 The rules of Toroidal Sudoku are similar to standard Sudoku, since you must place each of the numbers 1 to 9 (or 1 to whatever the width of the puzzle is) into each of the rows and columns. However whereas standard Sudoku also has bold-lined boxes that must contain 1 to 9, in Toroidal Sudoku these boxes are replaced by different bold-lined shapes that must contain 1 to 9 instead. 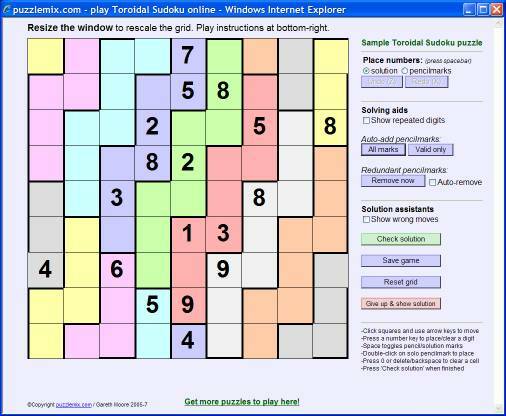 This is very similar to Jigsaw Sudoku, except that now some of those shapes also 'wrap around' the edges of the puzzle, travelling off one side of the puzzle and continuing in the square directly opposite. On puzzlemix each of these shapes is coloured a different shade so that you can see them more clearly. Put differently, you must also place 1 to 9 once each into each set of nine squares shaded the same colour.